The modest Los Pueblos Apartments are a well-known traditional low rise complex with good facilities. 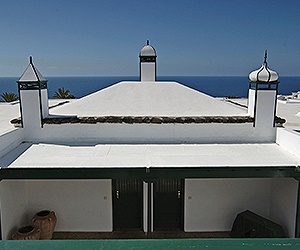 Ideal for clients who prefer comfortable accommodation in a good location near the harbour area of Puerto del Carmen. All apartments have the added advantage of a side sea view. 400 meters to the marina with its great selection of restaurants and bars. All Room Facilities include: The living area has a convertible sofa bed, TV, safety deposit box*, Kitchenette with 2 ring hob, kettle, microwave, toaster and fridge. Bathroom with bath & shower head. All units have a balcony with side sea views.